There are at least two artists called Lulu: 1) Marie McDonald McLaughlin Lawrie OBE (born 3 November 1948), best known by her stage name Lulu, is a Scottish singer and songwriter most known for the 1960s international hit record To Sir, With Love. A native of Glasgow, Lulu shot to fame at the age of fifteen with her version of Shout!, delivered in a raucous and extremely mature voice. Her backing group were called The Luvvers, but after several more British hits she left the group to become a solo artist. 1) Marie McDonald McLaughlin Lawrie OBE (born 3 November 1948), best known by her stage name Lulu, is a Scottish singer and songwriter most known for the 1960s international hit record To Sir, With Love. A native of Glasgow, Lulu shot to fame at the age of fifteen with her version of Shout!, delivered in a raucous and extremely mature voice. Her backing group were called The Luvvers, but after several more British hits she left the group to become a solo artist. In 1967 she made her debut as a film actress in To Sir, with Love, a British vehicle for Sidney Poitier. She had a major hit with the film's title song, which shot to No. 1 in the United States (in the UK, it was released only on the B-side of Let's Pretend, a much less successful hit). In the meantime, she continued with a thriving pop career in the UK and several television series of her own. 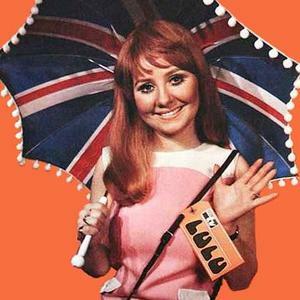 On 29 March 1969, she represented the United Kingdom by performing the song Boom Bang-A-Bang at the Eurovision Song Contest, and was joint winner with the representatives of Spain, the Netherlands and France?there had never been a draw before, and the rules were altered to prevent it ever happening again. In the same year, Lulu married Maurice Gibb of the Bee Gees in a ceremony in Gerrards Cross. Their careers forced them apart, and they divorced, childless, in 1973. Lulu then married her hairdresser, John Frieda, and remained with him for twenty years until another divorce. They had one son, Jordan Frieda. She became interested in Eastern mysticism and joined Siddha Yoga Meditation. In 1974 she performed the title song in the James Bond movie The Man With the Golden Gun. Lulu's singing career waned, but she remained in the public eye, continuing to act. In 1987, she played Adrian Mole's mother on television, and in the 1990s she made a comeback, guesting on the cover version of the Dan Hartman song "Relight My Fire", with Take That. The single reached number one in the British charts. She also appeared as herself in 2 episodes of the hugely popular BBC television programme Absolutely Fabulous. In 2000 she was awarded an OBE by the British Government. Her 2003 autobiography is called Don't Wanna Fight No More after a hit song she wrote for Tina Turner. In 2002 her gold album Together was a collection of duets with the likes of Elton John and Paul McCartney. In 2004 she released the album Back On Track and went on a UK-wide tour to celebrate 40 years in the business. In late 2004, Lulu became the host of her own 2-hour radio show, on BBC Radio 2, playing an eclectic blend of music from the 1950s to the 2000s, all having to do with the influence of songwriting. In 2005, Lulu released A Little Soul In Your Heart, a collection of motown Soul Covers and Soul classics, which entered the UK charts at #28. She has more recently appeared in the BBC's reality TV show Just the Two of Us in 2006 as a judge. 2) LuLu, a japanese visual kei rock band, also tagged as ????. Unlike most bands with a theme, which is usually more cutesy, LuLu's sound isn't like most costumed bands with a darker image and harder sound. In addition to this unique doctor theme,Taa's unmistakable voice is what makes this band stand out from the rest. "LuLu General hospital" is established in 2005. They don't call themselves as "band" , but as "General hospital" and they also call their "visitors" as "Patient". Their live music shows are called as "Meeting of medical examinations". They wear medical costume and play music, called as "Medication". LuLu announced that they would go major in April 2008 with their major debut mini-album Dr. Sterben, gathering popularity in the visual kei scene. They also announced that on June 23rd they would open their official fanclub, ICU. Two limited singles were released the next month, Kusuri and Doku, and were the first of LuLu's releases to make the Oricon weekly indies charts, appearing in sixth and seventh place. With no apparent break, they kept on going, releasing their first major album Nihon Iryu Kakumei a few weeks later on August 6th, with a tour following this release. In November, they re-released three of their sold-out releases from their time as an indies band. The year 2009 brought a huge change to the band. At their February 24th live, LuLu announced that Tatsurou, Kaito, Yu-ki and Shounari were leaving the band, but that LuLu would still go on with Taa. After this revelation, a new live was announced with the name of Resurrection of the Doctor, marking LuLu's second stage. It was at this live on March 11th in which the new 'doctors' were announced, with Sayuki as the guitarist of psychiatry, Yuki as the guitarist of internal medicine, Ryuusuke as the bassist of pediatrics, and Manami as the drummer of dental surgery.